I had to take the 8:35 a.m. flight to Bengaluru. Seems like a reasonable time. However, for someone on daily nocturnal dialysis, it can be a little uncomfortable. You need to leave for the airport by around 6:45. Which means you need to wind up dialysis by 4:30 a.m. which gives the tech time to reprocess the dialyzer and the bloodlines (yes, I reuse, can you believe it?!) To make things worse, the authorities decided that the denizens of Balamrai, where I stay, should wake up every morning by 6. So, they decided to cut power from 6 to 7 a few days back. Now, we are not yet into those days of the year where it is bright enough by 6. And the light in my room that is connected to the inverter decided to fuse a couple of days back and I had not changed it. So, I had to get ready in the dark! So, it was with not-so-heavy a heart that I said, "Goodbye, for a couple of days, Andhera Pradesh!" The cab ride from home to the airport is usually interesting. Last time there was an oblivious cabbie. This time, there was a detective cabbie. Within a few minutes into the ride, he asked me, "Aap doctor hai?" I was shocked. Was he also teasing me like my friends did? I denied the allegation. He then explained his faulty conclusion. He had seen my car which had the NephroPlus logo at the back and the logo had a red plus sign in the middle. Deduction, eh? I remembered the scene from Pink Panther 2 and felt like asking him how the weather was in Balkampet that morning? And then pithily add that the red sand below his chappals was found only in Balkampet in the city! I refrained. It is amazing how similar the two languages are. Many of the letters are written almost exactly alike. Many words are also common. In fact, I strongly suspect that Kannada was derived from Telugu. Of course, true blue Kannadigas suspect that Telugu was derived from Kannada! When I was travelling with some friends from Bangalore to Coorg a couple of years back, we were lost and needed to ask for directions. The people on the road knew only Kannada. I advised my friend who spoke good Telugu to speak Telugu like he was drunk (in a blurred manner, if you get what I mean). The trick worked. Blurred Telugu = Blurred Kannada! 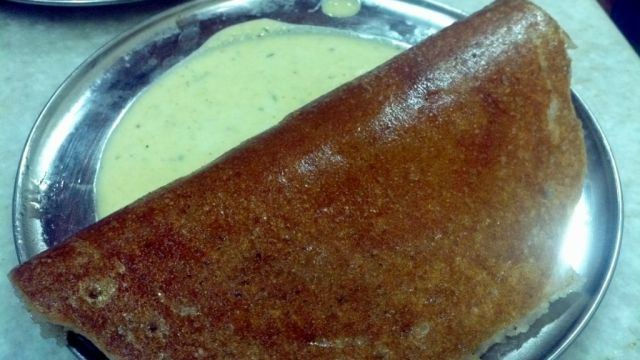 The dosas in Karnataka are very different from those served in Andhra Pradesh and Tamil Nadu. Karnataka dosas are much thicker than those served in AP or TN. Despite this, they are crisp on the outside and very soft on the inside. I wonder how they manage that. A few months back, when I went to Bangalore, I got a chance to sample divinity in the form of Idlis at Brahmin's Coffee Bar at Sankarapuram. This time my friend Sandeep suggested I try Vidyarthi Bhavan at Gandhi Bazaar. I secretly wished I could do both but time is never your friend on a trip as rushed as this. So, I reached Vidyarthi Bhavan around 8:45 in the morning and found myself in a place that had a sparse setting. I settled down on a table which had a couple of other strangers already munching away greedily on some crisp, deep brown dosas. Recounting everything that I ended up eating would be gross. Suffice it to say that I had at least one dosa. It was truly heavenly. Thick like a genuine Kannadiga Dosa (if there ever was such a thing!). Crisp, deep brown on the outside, very soft on the inside, practically soaked in ghee! They served only one chutney with it. No sambar. That was a message basically to focus on the dosa! I did not complain. As I left, I looked back at the spartan hall of Vidyarthi Bhavan. I couldn't help remark to myself, "Truly, it is in places such as these that India resides." The secret to the crisp outside of a Karnataka dosa is that they add a bit of sugar in the mix. The caramelized sugar gives it the crisp outer!